I needed 4 instrument approaches for my IFR currency, which expired last month. I flew three approaches last weekend, wearing foggles and with my friend Itay in the right seat. That flight was mostly an exercise in controlling the autopilot on the 182’s G1000. I’d give myself a B+ on my mastery of the autopilot: several times I thought that the autopilot was flying the approach, when in fact it was trying to hijack the plane, probably to Cuba, and I had to disable it. I felt like Dave in “2001, a Space Odyssey”. 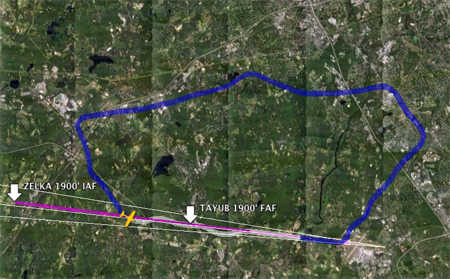 I flew three additional approaches today. The ceiling was between 400’ to 800’, the constant pouring rain added strange sound effects, the windows were foggy, and my CFI John was in the right seat. I wanted to take an Arrow for this flight, but it is grounded, so I flew a Warrior. Although I had an iPad running ForeFlight with geo-referenced approach plates (and obviously running CloudAhoy as well), and although the Warrior has a Garmin 430, I decided not to use them for situational awareness, and use paper only. There’s something pure and unspoiled about doing it that way. Flying with John is always super educational. Flying with him, I think that on average I learn something new every 14 minutes; but in this flight the rate was even higher. I started the engine and put it on 1000 RPM, then as I was dialing the frequencies in the radio John asked me if I looked at the engine’s RPM. I looked, and it dropped to 900. Ah, I said, I should use the friction lock to keep the throttle in place. I reached out to push the throttle, but John suggested that instead I try carb heat. I set carb heat and viola, in two seconds the RPM came back up to 1000. I built ice in the carburetor! If I had flown the Arrow or the 182, I would not have learned this – both have fuel injection. The first ILS approach was uneventful. Not my best, nor my worst ever. We broke out at 600’, and I could see the runway lights straight ahead although the runway was still in the mist. Breaking out from a cloud base and seeing the runway lights straight ahead is probably the most rewarding price in aviation! John asked me not to look outside and fly the remaining 200’ to the Decision Altitude looking only at the panel. I flew the missed, and immediately got sucked back into the soup. I sometimes wonder whether the term “soup” was coined in Boston, where the locals eat Clam Chowduh (myself, I don’t care much for this local delicacy). On the second approach, which was a Localizer approach, John asked me if I ever flew partial panel in IMC. No I didn’t, and today was therefore my first time. John covered both the AI and the heading indicator, and my flight started to look like a drunken pilot’s. John suggested that I use the 430’s compass-like display, and I did. As I was trying to manage the situation, John kept asking me questions. For example, if I wanted to use the magnetic compass, what type of errors should I be more concerned about: turning errors, or acceleration errors? I figured that since I am not accelerating much in this flight, the correct answer would be turning errors. No, said John. He took the yoke and showed me what happens to the compass when the plane’s airspeed changes as it climbs or descends a mere 50’. If you want to fly in IMC using the magnetic compass, said John, you better train for it. I kept flying while John kept asking me a never-ending stream of questions. What would be the next heading from ATC? Where are we now relative to TAYUB? What’s your primary gauge for pitch right now? I think that in addition to teaching me, John was trying to saturate my brain, the way it would be in a real partial panel flight in IMC. Obviously, if you really lose your vacuum while in the soup, it’s a good enough reason to declare an emergency. The third and last approach was ILS, still with the two gyros covered, and John suggested that I ask ATC for a no-gyro approach. I have read about it once, but never practiced it, certainly not in IMC. It was the coolest thing. The controller acted in a very un-Bostonian manner, and worked with me with a lot of patience. As I was flying, I said to John that the controller must be frustrated having to do this extra work, but John calmed me by saying that the controller probably appreciates the opportunity to practice this as well. The idea in a no-gyro emergency is that instead of giving you vectors, the controller tells you when to start to turn and when to stop turning. Looking at the CloudAhoy track above (with the published ILS approach overlay), indeed both of us learned during this approach. Both he and I improved as the flight went on. John then taught me another thing (I lost track of how many new things I learned). Bend my leg so that the knee is higher and almost touches the yoke, rest my hand on my knee, and then fly the plane with my thumb and pointing finger. This is so relaxing (assuming that the plane is well trimmed). And is very precise as well, exactly the extra precision that the situation required. I also used the pedals a lot for fine heading changes. After intercepting the localizer, I started to chase the needles. “Chasing the needles” is obviously a bad thing, something to be frown upon, but I think that without the vacuum instruments this is essentially what one does. Looking at CloudAhoy’s altitude and course profiles below, it’s obvious that my chasing of the needles could have been done much better. All in all, I was pretty happy with my performance, given the rust level and the workload. 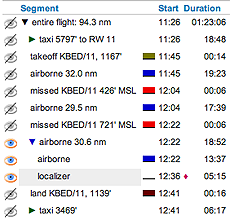 CloudAhoy’s segments list, above on the left, shows that on my first ILS approach the missed was taken at 426’ (the minimums are 383’), and the missed on my LOC approach was taken at 721’ (the minimums are 720’). The chasing of the needles on the third approach is shown in CloudAhoy’s profiles on the right. While flying it, it did not feel as dramatic as it looks in the profiles, or as it looks in the ground track. It’s one case where CloudAhoy has a sobering effect. The two things that I am taking from this segment of the approach, thanks to CloudAhoy, are: (1) don’t turn more than 1/2 standard rate, (2) have patience: turn a little, stop the turn and see where the needle is going. The rapid rate of teaching me new things did not end while taxing back to the ramp. 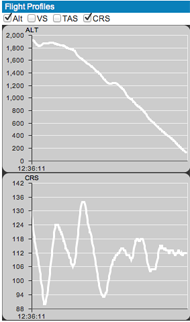 As I cleared the active, I pushed the VFR button on the transponder to set it to code 1200. John asked me: supposed you pushed it by mistake, what’s the best way to put in the previous transponder code? I did not know of a quick way but there is one (on that specific transponder): you long-click the button, and the old code comes up. John said that it’s the same on the G1000. Good to know! But an even more important educational moment was 10 minutes earlier, when I was established on the localizer and Boston handed me over to the Bedford tower. I repeated the instruction “6 November Delta, to tower”. Before I clicked the frequency flip-flop to talk to the tower, John keyed the mike and said in his quite voice: thank you very much for your help. The way he said it, it was clear that he actually meant it and was not only polite. The controller said in a cheerful voice, you’re welcome sir.